Ok, saw this terrible report and here were my initial thoughts, in no real order as they came at once in a jumble. - I mean, right? It's rare... right? - What is wrong with the Jews? - How did we get here? - I don't think this is exactly rare... Jews have been attacking Arab civilians since the days of Lechi and Irgun. -Are the hasbara trolls going to claim self-defense? -Who are their parents? Who are their teachers? How did people who, supposedly, were educated like me, for the most part, end up as members of a murderous, racist mob? What were your initial thoughts? PS: Please pay attention to the quotes 'after Israeli settlers pelt her car with stones'. 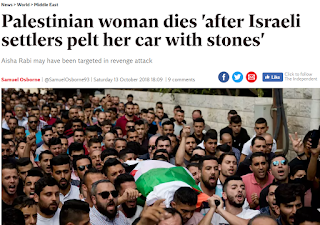 When a Jew is a victim, and the reporting is done the same way, RWers whine about the quotes. So don't forget they were used here, too. Attention. I am pleased to announce the formation of a new and important organization. We are the Coalition for True Jewish Values. Our mission is to issue press releases about how the Torah opposes everything Trump does. Our Posek will be Rachel Madow. I am currently seeking someone with a special expertise on #metoo issues to serve as managing director and two regional vice presidents to rewrite whatever MSN News said last night in Torah terms. If I get one or two people to join I'll be able to claim 1000 supporters. Are you with me? 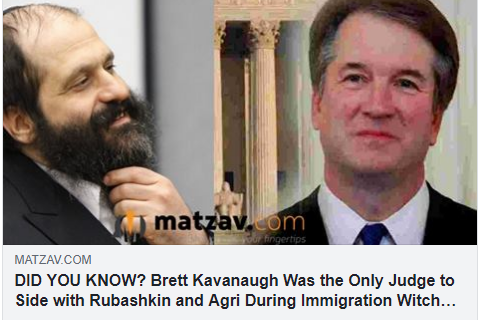 Matzav knows the real reason behind Kavanaugh's success. Apparently, Kav pleased God by supporting His Chosen One's right to exploit vulnerable people and being elevated to the Supreme Court was his reward. This is Zionism in 2018 and also why so many of us here in America reject it, together with Netanyahu and the Likud. Can you Israelis please develop a non-racist, non-jingoistic non hyper defensive form of Zionism for me to support? In Zechariah's famous Sukkot visions it's not us or them. It's us WITH everyone. Where are the political or religious leaders with even the smallest interest in working toward such a thing?